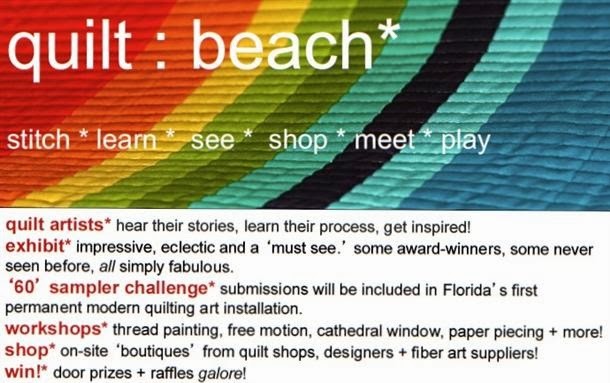 The Treasure Coast Modern Quilt Guild has invited Gainesville Modern Quilters to submit quilts to be included in quilt : beach, a modern quilt show in Vero Beach. The organizers will display our guild’s quilts together and send us pictures. There will be some media there, too, so it might be a nice opportunity to show our work! The organizers would like to know how many quilts our guild will submit. If you are interested please contact Brigit, brigitdermott@yahoo.com, who is coordinating shipping and submissions for us. The show is February 22, so we will plan to ship our quilts on Monday, February 17.